FAIRPORT, N.Y. - Local firefighters have adopted as one of their own a 9-year-old boy who died saving six relatives from a fire that destroyed his grandfather's upstate New York home. A stream of cars and fire vehicles made its way Wednesday to St. John of Rochester Catholic Church for a funeral service for Tyler Doohan and the fire's two other victims, his grandfather and stepgreat-grandfather. Tyler's mother, Crystal Vrooman, said her son was a "sweet boy" whose sense of humor made everyone smile. Firefighters clad in dress blues and white gloves from departments around the Rochester area and as far away as Buffalo lined the church lobby, The Rochester Democrat and Chronicle reported. Outside, fire engines lined the streets and firefighters directed traffic. At the church entrance, Penfield Fire Chief Chris Ebmeyer held a red-and-white helmet with a shield bearing Tyler's name, which he gave to the boy's mother. "We consider him an honorary firefighter," Ebmeyer said. 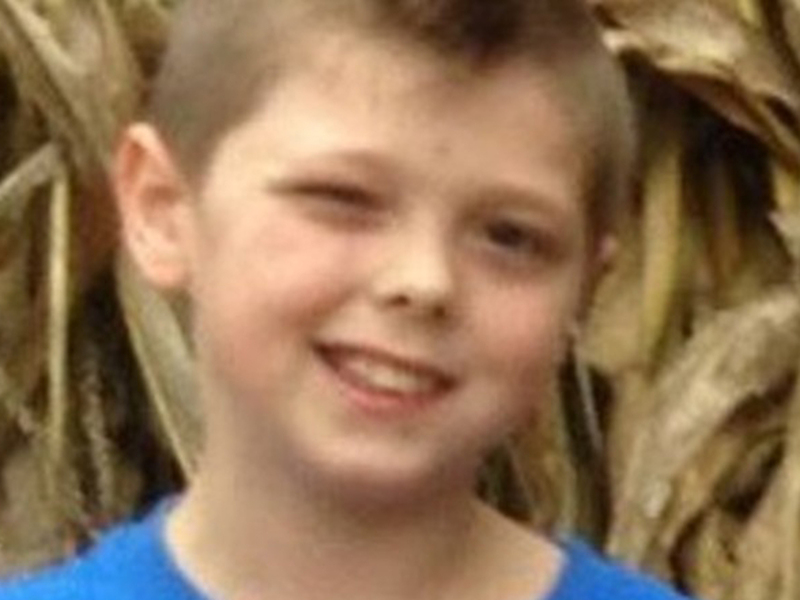 Tyler died early on the morning of Jan. 20 as fire consumed a single-wide trailer in Penfield. Fire officials say Tyler awoke six other relatives - four adults and children ages 4 and 6 - sleeping in the trailer but was killed when he tried to help his disabled grandfather. "I wish you were here for me to hold you," Vrooman said as she spoke of her son, CBS affiliate WROC in Rochester reported. "I know you don't want to see us sad, but we will see you again someday; and we will be happy again. You will never be forgotten." The funerals of the other two victims, 54-year-old Stephen Smith and 63-year-old Lewis Beach, were held at the same time as Tyler's. Smith, Tyler's grandfather, used a wheelchair and crutches after having a leg amputated because of health problems, the fire chief said. A basketball team from Silver Lake College of the Holy Family in Manitowoc, Wisc., traveled through the night to serve as pallbearers, WROC reported. "The players were taken with the story," Silver Lake College coach Phil Budervic said. "Our core values are compassion and community and we teach them that compassion has no limits and community has no boundaries. They looked at this as if it happened next door." Fire officials had said more than 100 firefighters would attend the service as a tribute to Tyler's heroics. "I think we need to keep in mind the honor that Tyler had in that moment when he was faced with the greatest danger," neighbor Rosanne Fabi told WROC. "We need to reach in our hearts and be our best selves through this." Reports indicate that after Tyler ushered most of his family out of the trailer, he turned around and ran back in when he realized two were missing. "He saved six people. They all would have died if he hadn't woken up," said Ebmeyer, who is chief of the volunteer fire company in Penfield, a suburban town of 36,000 residents. The fire chief said nine people were staying at the 14-foot-by-60-foot trailer when the fire started around 4:45 a.m. Monday. Tyler, spending the night at his grandfather's place because school was off for Martin Luther King Jr. Day, was awoken when the blanket covering his sleeping 4-year-old cousin caught fire, Ebmeyer said. Firefighters found Tyler's body a few feet from Smith's, Ebmeyer said. The trailer did not appear to have a working smoke detector, he said. A Monroe County sheriff's deputy and a firefighter arrived at the scene within a minute of the dispatch call, but the trailer was already engulfed in flames and smoke, Ebmeyer said. The first fire crew to arrive tried to enter the trailer but was driven back, he said. The cause of the blaze appears to have been electrical in origin, but the inquiry was continuing as investigators interviewed the injured relatives, Ebmeyer said. An online fundraising campaign set up on YouCaring.com has raised more than $30,000 for Tyler's funeral. All six survivors of the fire, including Tyler's 65-year-old grandmother, suffered minor injuries, officials said. Editor's note: An earlier version of the article misidentified the relationship among the victims.